Soooooo, I woke up this morning to a BB message from @sandragee. The message read: “We were NOMINATED!!!!!”. In my head I was like “errr ok”. I mean, I was still half asleep. Not exactly sure how to respond, I lazily typed “oh wow”. A couple seconds later, I was like “why are you wow-ing? what were y’all nominated for?” So I quickly added “for?”. For those who don’t know, “The Nigerian Blog Awards (NBA) were launched in 2010 to recognize excellence in blogging by Nigerians or by non-Nigerians who blog about Nigeria.” Click here for more information on the NBAs. 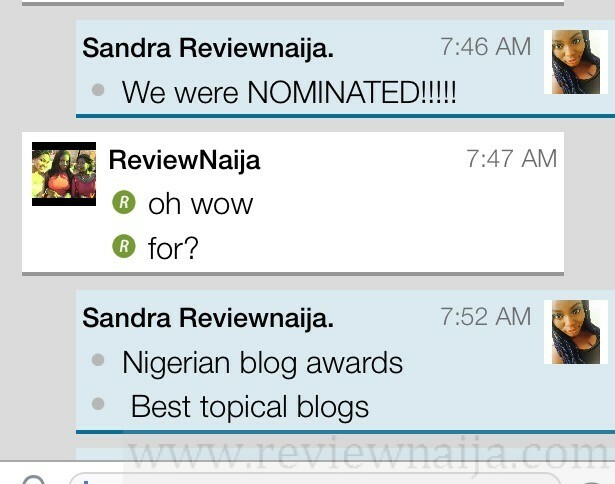 Well, turns out our very own ReviewNaija (or RN, as we like to call it for short), was nominated for the NBA as the Best Topical Blog in 2014! We’d like to say a BIG THANK YOU to all our readers!! And those of you who went ahead to nominate us!!! We really weren’t expecting this AT ALL! Plus, I hear it’s quite the process to be shortlisted for an NBA. So thanks again guys! We truly appreciate this. Voting opened up today, March 23rd and ends in 2 weeks (7:59am EST on April 6th). A maximum of one vote can be submitted per email address. Click here to vote NOW!! I just want to reiterate how grateful we are to be recognized like this. We do all this great work mainly because we feel like there’s a need for the information and reviews we provide. But we can’t build our database of reviews/recommendations alone; we need your help! You can submit reviews too; it’s super easy!!! Click here to get started and submit your reviews today! Thank you Yosola!! You are amazing. You guys do great work and deserve all the accolades u can get. There aren’t many review sites in naija, @ least none that I know of. Bringing the nigerian experience to the people @ ur own expense. I meant its awesome. Keep up the good work RN. We, ur fans, love u’all to blazes and back.